I write reviews. Why? In addition to being one of the few people I know who loves to write, I am thankful that there is a platform for sharing thoughts and opinions with thousands of people. It’s a very democratic concept and I take full advantage of it. 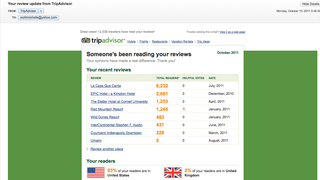 But recently I have noticed that TripAdvisor is doing more and more to appeal to my ego to encourage me to write more reviews. The company’s ability to drive reviews is undoubtedly what has made the company the market leader in terms of content, with more than 50 million reviews and opinions. First, as soon as 100 people have ready my newly posted review, I get an email letting me know about the milestone. Then, I get periodic updates about how many people have read my library of reviews. The last email I received (shown on the top left) blew me away. More than 6000 people read a review I wrote about La Casa Que Canta in Mexico. My voice is being heard, and not just in the United States. At the bottom of the email I got to see the demographics of my readers. be a contributor. Badges, used in many online businesses that require consumer action, have become a great virtual reward to incenticize consumers. 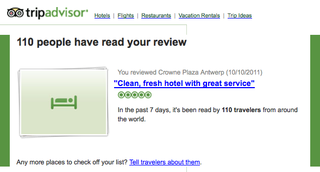 And when the hotel responds to my reviews and thanks me for taking the time to share my thoughts, I always feel good. As a consumer I feel like the system is working, from the review site platform to the hotel, to the community.